“If it’s good, I believe in it.” That was Wednesday’s affirmation. And it was surprisingly hard to find a just-right graphic to go with it. When I saw a certain photo of a bird, I felt I was on the right track. Then I had a sudden inspiration to investigate phoenix images. I know myself and what living means. I’m a survivor, reviver of dreams. I am eternal as spirit, not form. The core of my being is ever reborn. a spirit, a dream, a scorching desire. 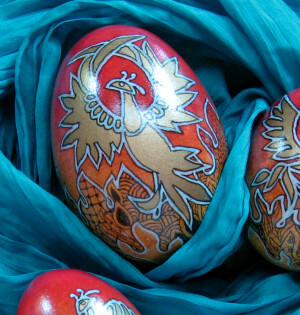 Suddenly I experienced an avalanche of design ideas involving decorative eggs. I had four ready to go: a goose egg, one large chicken egg, and two small chicken eggs. I penciled in some phoenix outlines, then hesitated. How to draw flames? After half an hour of experimentation, I found my best guess and penciled those in, too. I colored the birds gold and the flame outlines black, then erased the pencil guidelines. After that, it was a matter of filling in the flames with zentangle-inspired patterns and making one design adjustment after another. Again and again, flaws, mistakes, and ho-hum results drew forth creative responses that improved the images. Now that the designs are done, I realize that shortcuts could have been used that would have improved the results. That information can be used on future pieces. 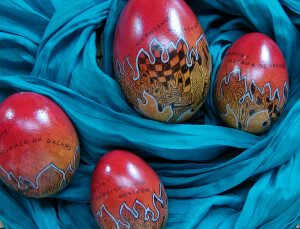 Each egg has an affirmation lettered on the back, and each of those relates to the poem I wrote. Ethan kept admiring the evolving designs and asking, “Okay, what have you learned?” I learned about the behavior of my paints and their interactions. I learned some touch-up tricks. I learned how to handle the eggs and created a good base to set them on while spray painting fixative. And I reinforced the knowledge that the smaller an egg is, the more curved its surface is, and the harder it is to work on. The small eggs took just as much work as the big one. (I intend to sell them as a set, not individually.) 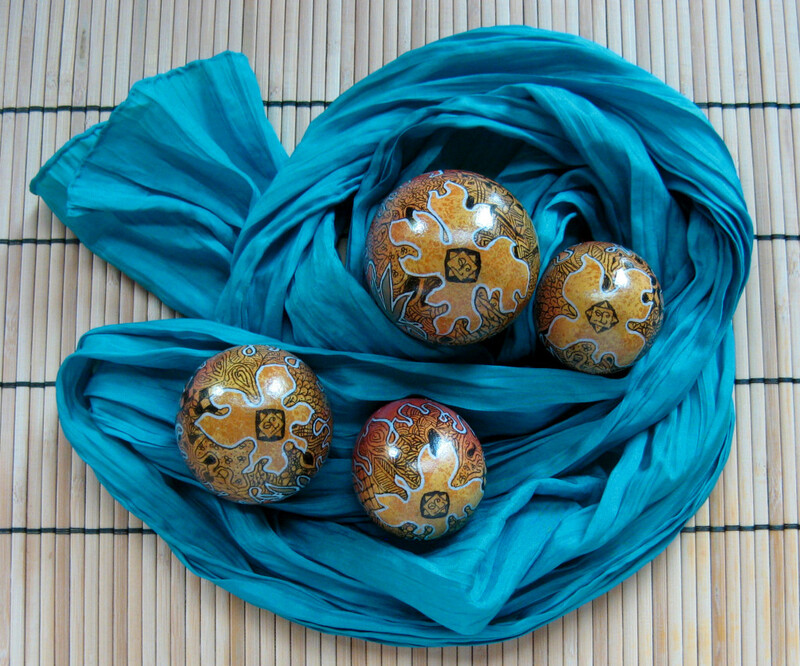 The main learning is how joyful I feel when working on art projects of my own choosing.